Chris Duke starts work on his 1969 Chevy C10 project truck. The dash and firewall get welded on, the frame gets painted, and more. Welcome to the 99th episode of Motorz! In this episode (S08E05), Chris Duke heads back to cactus country, Arizona, to start working on a his new project vehicle, a 1969 Chevy classic C10 pickup truck. Britt Hall (Vintage Speedshop), Mike Galindo (Painkiller Customs), and Ronnie Wetch (C10 Talk) guest star. In this episode, Mike Galindo from Painkiller Customs comes out to help remove the old dash and weld on a dash and firewall from LMC Truck. 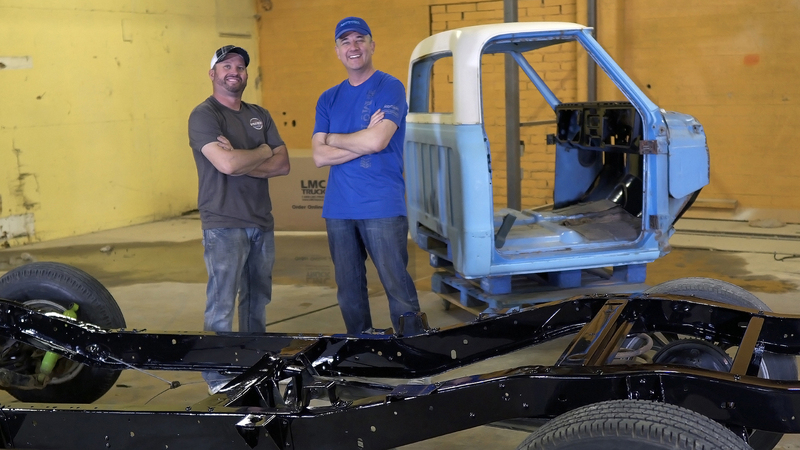 Then Chris and Britt spend hours grinding down the frame to bare metal before giving it a fresh new look thanks to POR-15, a self-leveling chassis paint that you have to see to believe. Chris also sits down with Ronnie Wetch from the C10 Talk podcast for a chat. Finally, Chris shows you CRAFTSMAN’s new V20 cordless and brushless drill/driver kit. Be sure to stick around for the credits at the end for some funny bloopers! Hello! Automotive Improvement and the Motorz logo are registered trademarks of Duke Networks, LLC.